Psycho is the third of four Alfred Hitchcock films on the AFI Top 100 list, joining North By Northwest (No. 55), Rear Window (No. 48) and Vertigo (No. 9). I am certainly a Hitchcock fan, but I’m not as huge fan of Psycho. I’d seen it before and watching it again yesterday it felt a little dated and suffers from something that a lot of the films in this list suffer from — its reputation is better than the film itself. This has been a common theme for me on this journey. Films that are supposed to be American classics or “great” turn out to be dull, dated or flat-out bad. Psycho is a good film, but it’s not worthy of being #14 on this list and in my humble opinion it’s not even among Hitchcock’s best. I think Psycho definitely has a place in film history, being perhaps the first successful and critically well received “horror” films. And it definitely deserves credit for its disturbing matricide theme and Anthony Perkins’ terrific portrayal of Norman Bates. 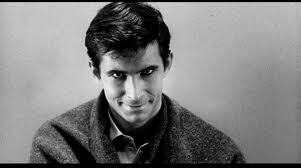 Perkins set the standard for the “psycho” character and he plays it so quietly and internally that it will live on as one of the best film characters ever created. Unfortunately for Perkins he was never able to move beyond Norman Bates and the typecast despite clearly being a promising young actor. That being said, I suppose most actors would be thrilled to leave a legacy like Norman Bates. But in terms of entertainment I really wasn’t that impressed. I am a huge fan of North By Northwest and To Catch a Thief. Vertigo and Rear Window are just ok for me, but I can definitely say I liked all of those films more than Psycho. That being said, you have to give Hitchcock credit for the creation of Norman Bates and for giving us the shower scene, which had people across the world afraid to get wet for years and has been stolen in tribute on many occasions. Few film fans will ever forget those two legacies. I also have a bone to pick with the ending. The film should have ended with Bates’ arrest. Instead, Hitchcock takes us to the police station where the psychiatrist comes out of his interview with Bates and then tells us the whole story of how Bates ended up the way he did. The whole scene isn’t needed. It was patronizing to have someone explain the plot to us at the end — we got it without the narrative. He killed his mother and brought her back to life through his psychosis and related actions. I like it better when the film goer is left to explore the themes on his or her own following a film. Makes for great after film dinner conversations! Len, it’s been an interesting journey. After you’re done, I’d be interested in seeing which films you’d leave on the list and at least a few films you’d add. Thought I’d say this now to get you thinking about it. I think that the film’s ending helped the audience humanize and sympathize with Bates in a way that just abruptly ending it would not have. I haven’t read Bloch’s book, so I don’t know how he ended it, but what makes this movie different – and better – than other slasher movies was the psychology of the film. As a viewer, I could see – and understand – the motivations of every character. I also like the after-film conversations. I find myself constantly exploring the motivations of characters. In this film, I always found myself exploring and asking the questions of how this could have been avioided. I am a Hitchcock fanatic, and while I don’t want to argue specifics (mainly for lack of time), I think you’re giving this masterpiece short shrift! Then again, I’ve disagreed to varying degrees with many of your reviews—which is part of the reason I’ve kept reading. It’d be kind of boring if we all saw art through the same lens and filters, and I’ve enjoyed very much reading your impressions. While I envy you the free time, I can’t believe you’ve made it this far and can’t wait to read the Top 10. And then what? Rolling Stones’ Top 500 albums or something music-related next??? You should also watch the recent film “Hitchcock” it really puts this film into perspective of the times.